Many homeowners who like the idea of painting may not like the reality of painting. House painting begins with a lot of fun when you are selecting colors at the paint store. After you start laying primer and paint on the walls, it devolves into ordinary labor, especially when it comes to that second coat. Masking windows, putting down drop cloths, removing light fixtures and outlet/switch plates, as well as buying the paint, tools, and other materials can take hours. Often, this blends into the task of painting because the painter goes directly from prepping to painting. Is there a way to get by with painting just one coat? A type of interior paint called one-coat paint promises to end the misery of applying that second coat. With one-coat paint, the idea is that you'll be able to remove the painter's tape and drop cloths right after that first paint coat, and start enjoying your freshened-up room. How does one-coat paint work, and does it really even work at all? One-coat paint is a term used by paint manufacturers for heavier, thicker acrylic-latex interior and exterior paint. Up to 20-percent more paint solids give the paint more body. Ordinary acrylic-latex can stop at one coat, but only under limited conditions. One-coat paint increases the possibility that you can get by with only one coat but it is not an absolute since limitations do apply. With one-coat paint, you typically must stick to a color palette that is specifically geared toward that one-coat paint series. A type of one-coat paint has existed for years under different names. 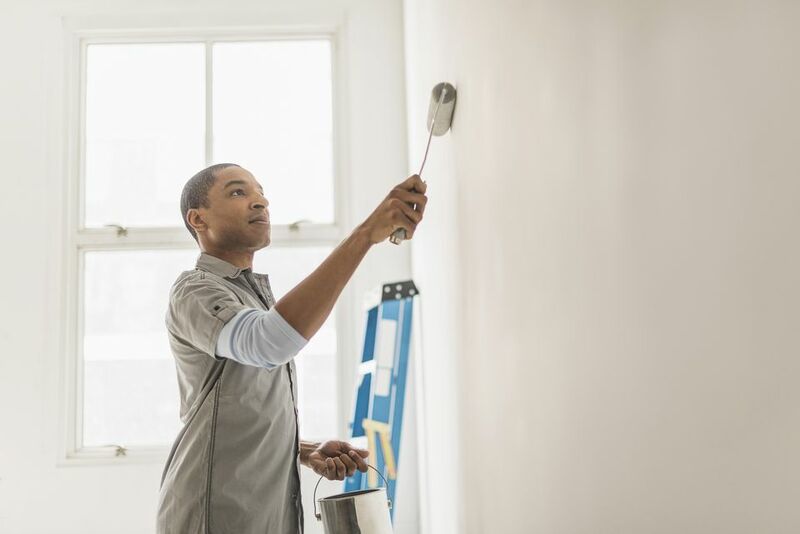 Paint brands such as Zinsser Perma-White and Kilz 2 have been coating thick paint on homes for decades in response to emergencies such as stained ceilings or water-flooded walls that have been dried out and put back into use. But a newer class of heavy-bodied paints has emerged that no longer aims to apply only to disaster repairs. One-coat paint is about reducing painting time for busy homeowners. Unlike the one-color-only whites of the Kilz-style paints, one-coat paints offer a selection of colors. 10 - 12 Behr Marquee Marquee&apos;s closest competitor at Home Depot is Behr Premium Plus. 9.68 Glidden Duo Glidden products are also carried by Home Depot. 8.67 Behr Pro Behr Pro is positioned by Home Depot as a bulk paint to be purchased mainly by paint contractors. While a pound or two may not seem like much, it is significant where paint is concerned. Total paint weight usually means that the paint has more solids, and solids are the ingredients in the paint that remain on the wall after drying. One-coat paint is not guaranteed to accomplish the goal of saving you from that second coat in every instance. Manufacturers' one-coat paint guarantees often exclude repaired surfaces, porous surfaces, surfaces that have previously been uncoated, surfaces that contain tannins (such as cedar), and surfaces with aggressive stains. One-coat paints often have a specified range of colors that you must choose from. However, most manufacturers of one-coat paints have palettes of hundreds, even thousands, of colors. While one-coat paint offers advantages, there are a few aspects of laying down multiple coats of paint that one-coat products cannot duplicate. Multiple coats help to obliterate overlaps, smears, and lines. Extra coats deepen the color, making it richer and closer to the paint manufacturer's intended color register. Multiple layers also physically strengthen the paint. This is highly important for exterior painting. For door and window trim, you may want to lay down two coats or more because those areas experience heavy use and particularly need durable paint. Professional painters tend to recommend rolling out two or more coats of paint. One point that professionals sometimes make to budget-conscious clients is that the bulk of the work is wrapped up on preparation. So, clients would not save much money by using only one coat. While multiple coats always mean spending more money on paint, the professionals often thin down the second or third layers, thus reducing the need for more paint. When matching the existing color and that coat is still in good condition both physically and from a color standpoint, you can usually paint just one coat and achieve satisfactory results. Similarly, when painting over pre-tinted primer that is close to or matching the eventual room color, the need for two coats can likely be eliminated. Interiors, especially clean, low-impact areas such as living rooms and dining rooms, are forgiving environments for one-coat paint jobs. When painting a ceiling, unless the ceiling is especially stained, a single coat is often all that is needed. When painting areas that are rarely used and receive little attention, such as a basement bathroom, you may be less inclined to add multiple layers of paint. What Is the Best Home Depot Paint? Paint the Walls or Trim First? Not Necessarily a No-Brainer.